My Aadi had his birthday on the 8th of May but the school usually celebrates the kids’s birthday’s later. In fact they celebrate all the birthdays of the month on one day. Makes sense right? 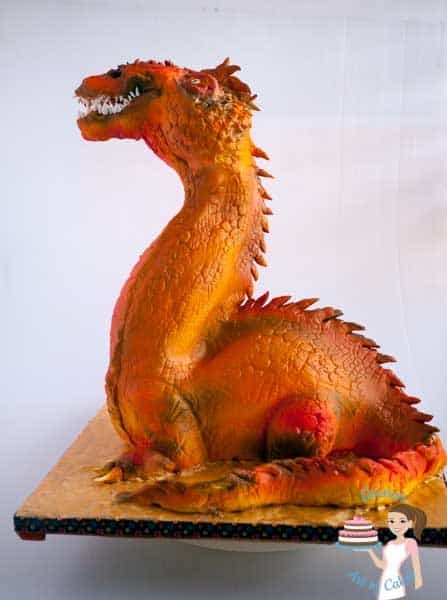 Much before he could decide what he wanted for his birthday he had already told everybody in school that he will get his mom to make ‘Smug’ the dragon cake for him. So of course all the kids were so excited. 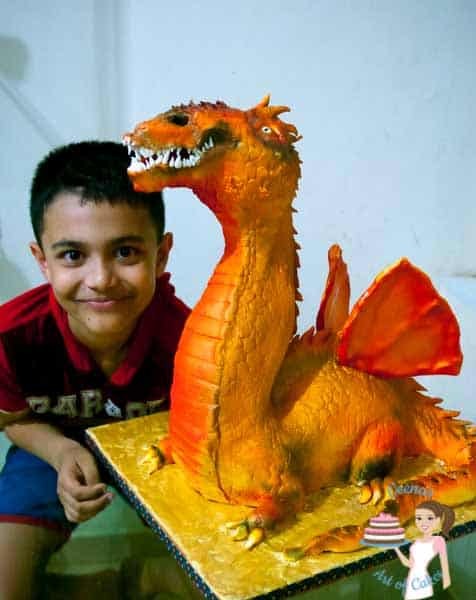 They’ve seen Aadi’s amazing cakes before so…!!! 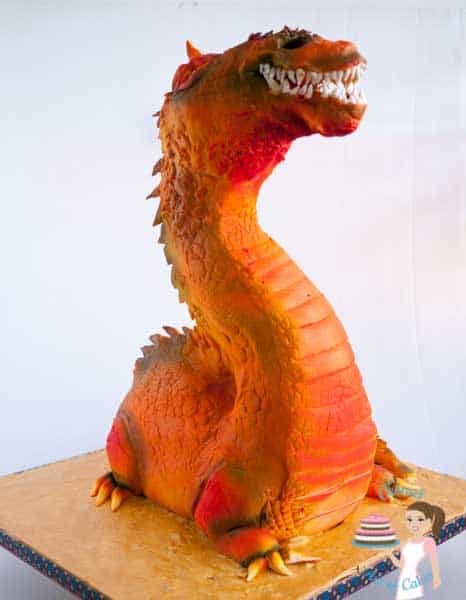 If you look at my gallery; you will see that I do never do the gory scary cakes so while I had no problem making the dragon cake, I didn’t agree to making smug. I mean come on!! 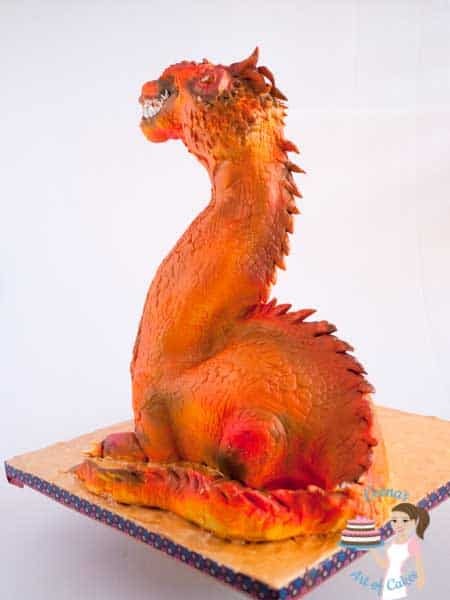 My personal opinion is that cakes have to look edible so I never get myself to do cakes with blood oozing out, or really ugly animals or even the cakes with broken body parts. I’m not saying there is anything wrong with that. It’s just not my type of thing. I’m sure there are some of you that feel the same way about it. Don’t get me wrong – gosh I adore the talent and wish I could do such an amazing job so no – it’s not that. It’ just ME!! have you taken advantage of the latest offer I got you on the Cake Business School review plus bonus? 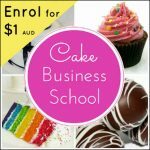 She would love to offer an exclusive and limited time bonus –> For the next 20 people who enrols in Cake Buisness School; they will receive a free 30 minute ‘Sweet Business Success Session” business consultation via Skype, valued at $50AUD. 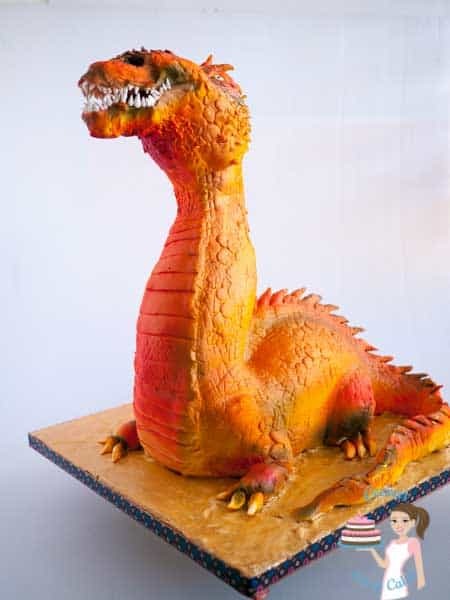 So I told Aadi’s I’d be happy to make him a dragon cake but it wont’ be smug or it wont’ be the ugly brown one he wanted. Once we had that off the table we were all excited about the cake. So the idea was to make the neck long. That’s something that really fascinates Aadi – the long neck and the long tail. So I had to think of how I was going to balance the neck. This is what I used as my base. A threaded rod that was about half way up the neck. This then had a copper pipe twisted in the shape of the next. The cake was unit half the neck and the rest on top was all modelling chocolate. The cake was done in Satin Ice white and my white modeling chocolate. So he was white completely white!!! 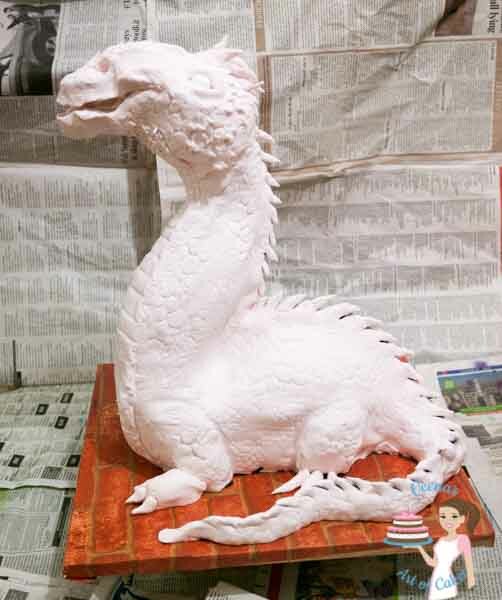 And yes I put a lot of newspapers when I am airbrushing because I still do not have anAirbrush stationto airbrush my cakes. On the wishlist. I created some hightlights and shadows with blackand green. 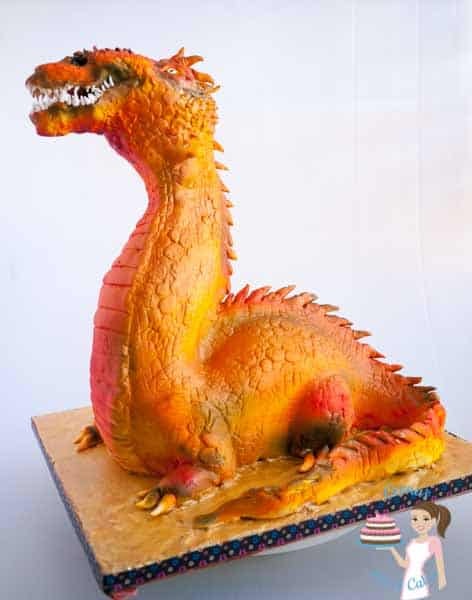 For the dragon’s I textured the fondant with the Marvelous Molds Alligator Mat and then used my Sugar Shapersto enhance those textures. I personally hate the idea of fire crackers on cakes but it’s very common here. Almost all birthday even with white chocolate sauce have these sparklers lite. Anyway, since it was a Dragon and of course we wanted a fire breathing dragon? This time Aadi got me to light his birthday Dragon !!! You can see it on the video here. 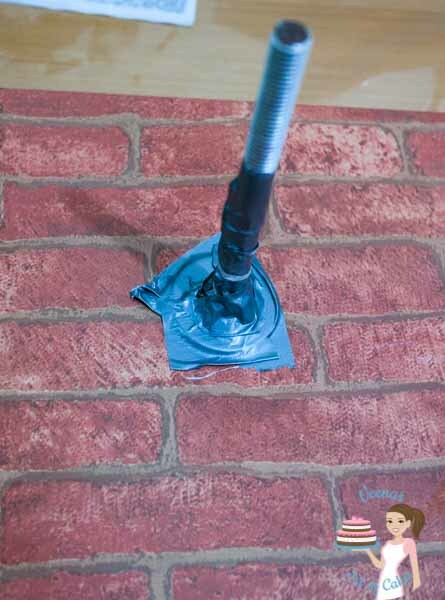 I have taken away the sound as it was really noisy with the kids. The kids were kept far to avoid any accidents. I do hope you like the little information I shared with you on this post. Feel free to ask any more questions below and I’d be happy to answer you. 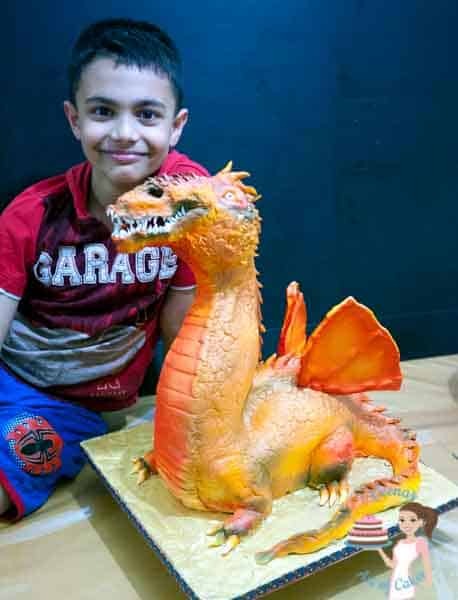 And finally here’s my baby with his dragon cake again. All smiles. The joy you get when you make your kids happy is incomparable. It’s amazing how happy and proud he was for days because he’s friends could not stop talking about his cake. Even the teacher told Ziv how excited all the staff were about Aadi’s cake.